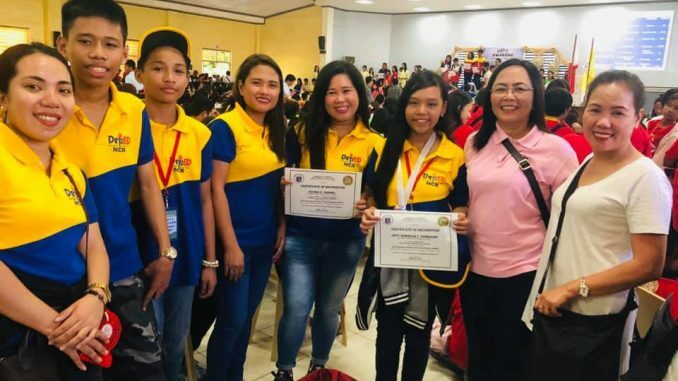 Jacy Danielle I. Gonzales, a grade six Campus Journalist in San Isidro Catholic School won 2nd Place in Science and Technology Writing in the recently concluded 2019 National Schools Press Conference with the theme, “Fostering 21st Century Skills and Character-Based Education held on January 28 to February 1,2019 at Lingayen, Pangasinan. Gonzales bested 50 contestants from the 17 Regions all over the country. These are the top 3 winners who were proclaimed as the best writers in each Region in Luzon, Visayas and Mindanao. Gonzales’ victory is attributed to her fervent prayer and strong desire to win the competition. The untiring support given by the School administrators and the Schools Division’s Office have greatly contributed towards her remarkable success. Ms Elvira S.Rabino her trainer-School Paper Adviser shared the victory. Meanwhile, in preparation to the contest, the National Capital Region conducted a 2-day training on January 16-19,2019 at Eurotel, Alabang. This initiative is in support to the Regional Winners who will represent the region to the said contest. The NSPC qualifiers of DepEd Pasay were also given a follow-up session on January 22,2019 at Epifanio Delos Santos Elementary. This activity was headed by Mr. Librado F. Torres, Chief Education Program Supervisors and was facilitated by the selected school paper adviser-trainers. In an interview, Jacy said that the competition was unforgettable. A lot of things were gained and meeting different people added to the factors. She considered it an opportunity and a blessing as well. She is grateful to the full support of the administrators. She even shared one of the most remarkable lessons, the story of Alchemist by Paolo Coelho, “No matter where we are or what we do, we must always try to balance our goals and experience. “Accordingly, she needs to do her best to achieve goals in life but never to forget to cherish the moment because those moments in life will teach her the best lessons in life”.